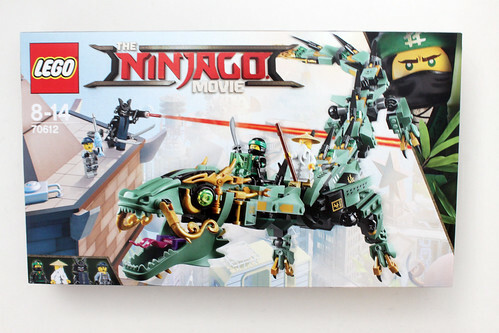 My reviews of The LEGO Ninjago Movie sets are well underway and I’ve gotten quite a few requests to do a review on the Green Ninja Mech Dragon (70612). 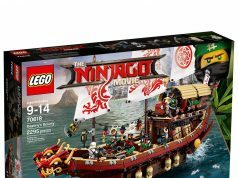 It is one of the medium-sized sets in the wave coming in at 544 pieces and retails for $49.99. 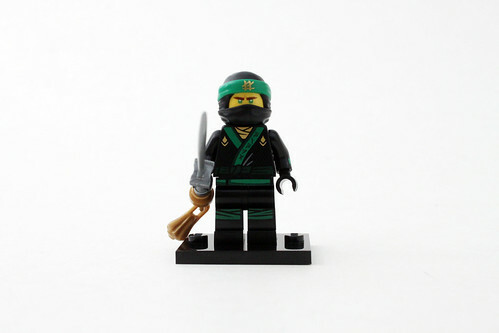 The Green Ninja, aka Lloyd, has a new black and green outfit with some printing going across the chest spelling out the word Ninja. He has a two piece mask however I do with there was Lloyd’s regular hair piece included as well. He has a double-sided head with one side being an angry expression and the other a confused one. His accessory is a sword with a pearl-gold chain tassel which I like. 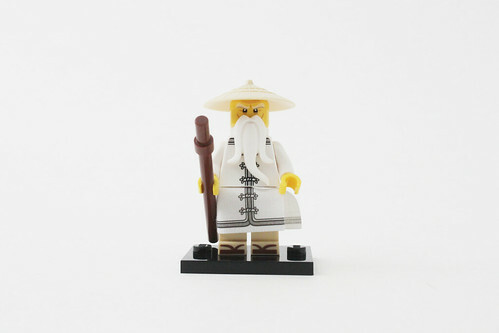 Master Wu has a new white robe with printing of the fasteners going down the middle. He also has a cloth skirt piece with similiar printing. He only has a single-sided head with a stern look. The white beard piece is the same one as before. 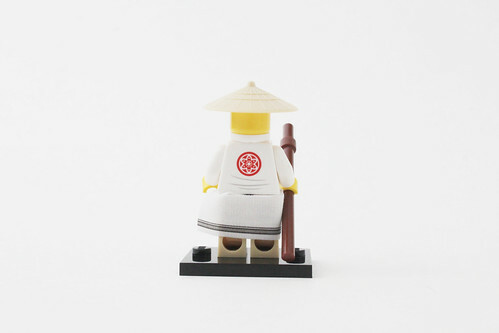 One thing that is new, however, is the tan straw hat with an updated design. 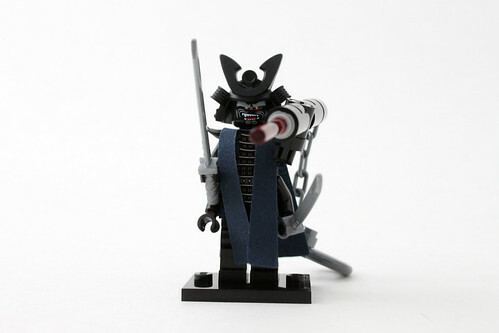 Garmadon, like with his previous versions, has two torsos, one of which has printing of his armor while the other has printing of his ribs. Going over the torsos is a paper robe/cape piece. 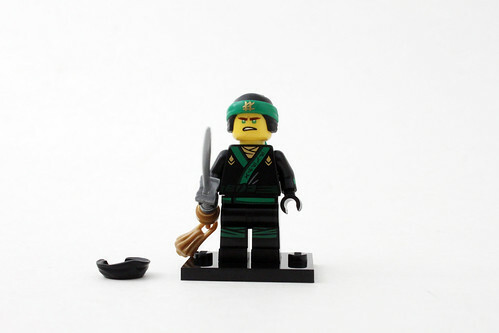 Garmadon has an evil expression and he wears a large helmet. 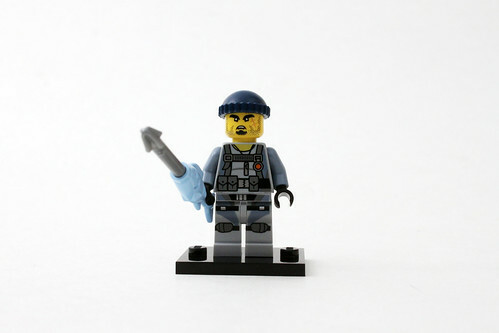 His accessories include two swords and a laser pointer keychain. 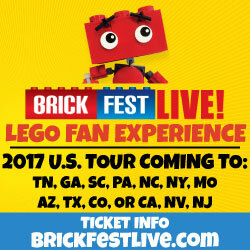 If you’ve watched the new SDCC 2017 trailer, you may have seen it in use. 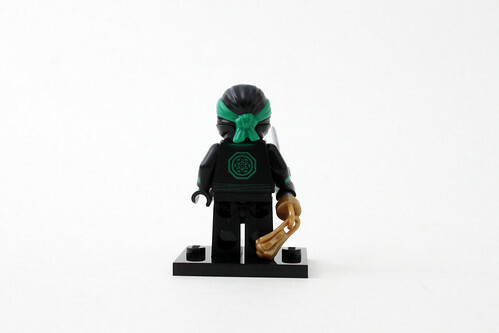 Finally we have Charlie who we assume works for Garmadon. The printing of the torso and legs are of a tactical suit. The outfit is not the same as the one seen as my previous review of the Ninjago City Chase (70607) which has some slight differences. 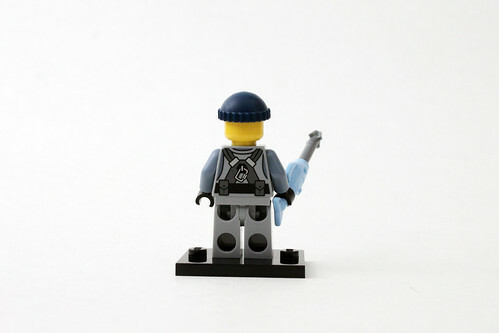 His accessory is a fish spear that uses a light-blue fish piece. 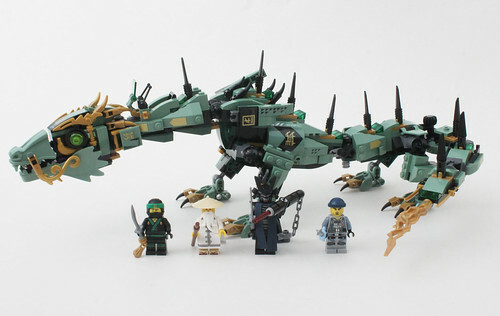 The only build is this set is the Mech Dragon and I will say that it looks fantastic. 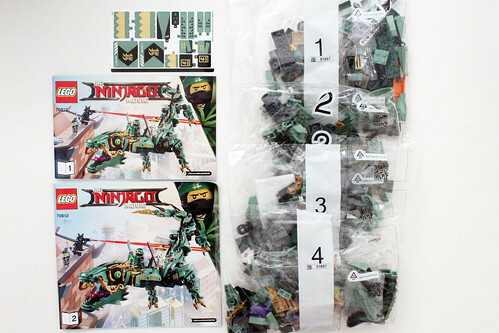 I haven’t built many Ninjago dragon sets and the only one I’ve reviewed was The Golden Dragon (70503) way back in 2013. 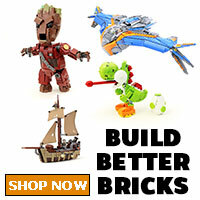 Obviously, this set is a huge upgrade and there are many reasons why. 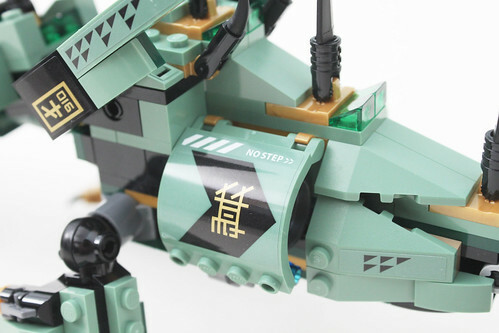 The whole dragon comes in a sand green color and has a very organic feel to it when you look at it from afar. 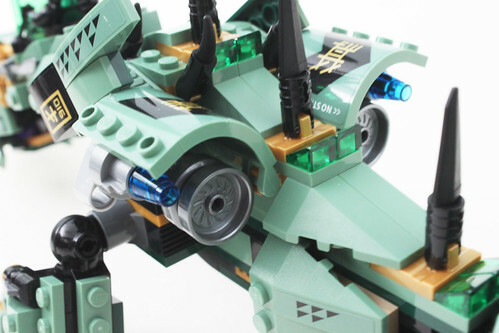 Since it is a mech, there are some areas where it looks fairly rigid but it still looks great nonetheless. For the head is probably my favorite part of the dragon. It is attached to the neck using a ratchet joint and it can turn to many positions that make it come alive. 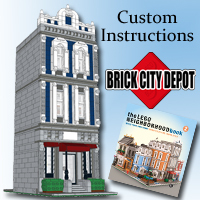 There’s a sticker to give some extra detailing. The eyes are actually a trans-green minifigure head that is in a bowl. The mouth is able to open very wide and it also has a tongue that is made from a flag piece. There’s also a lot of pearl-gold pieces including the banana next to the eyes and tooth pieces on top of the head and bottom of the mouth. 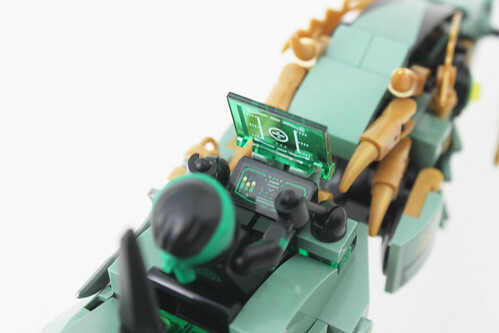 The neck area has a cockpit for the Green Ninja to control. The panel is a sticker however the trans-green screen is a printed piece. There’s even a clip next to it for the sword as well. The whole neck is on hinged ratchet joints and it can look up fairly high. Going down the back of the Mech Dragon are some black fin pieces for its spikes. In the middle of the body are a couple of hidden thrusters that are able to pop out during flight mode. The panels that open up has a large sticker on it. 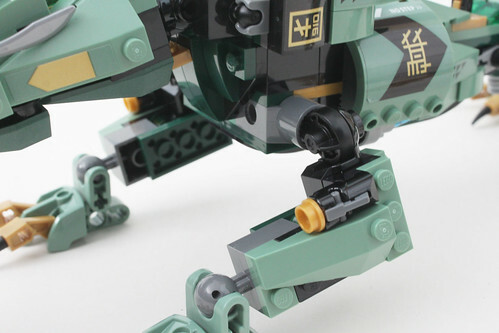 Both the front and hind legs are on ratchet joints while there are ball joints at the ankles. 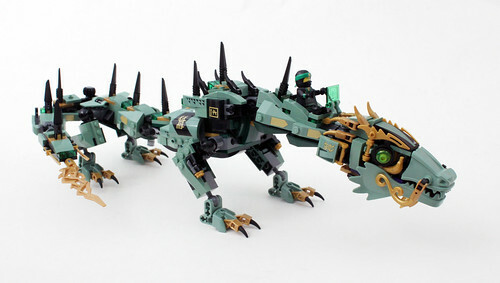 Using this combination of parts give the Mech Dragon a lot of poseability which I really appreciate. You can get it into a normal standing pose to a crawling one with ease. The front legs have a couple of stud shooters as well. 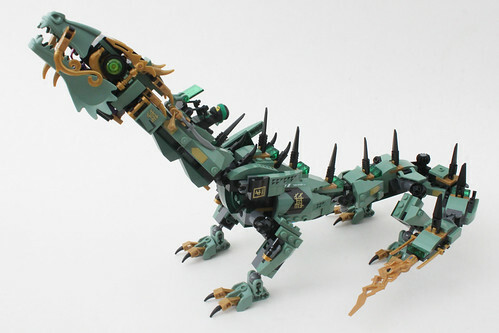 The section behind the body and in front of the hind legs is connected by a Technic pin and it has some swivel in that area but not much. The tail sections have a lot of playability as it has a wheel turning function to make it whip around. It uses some new 2×4 hinged pieces to connect the sections and it actually looks really good when you turn the wheel. 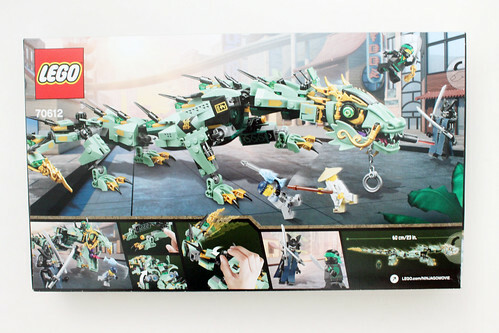 After building it and staring and swooshing it around for a bit, longer than I should, I will definitively say that The LEGO Ninjago Movie Green Ninja Mech Dragon (70612) is the best dragon set that LEGO has made so far. Although it is a technically a mech, you can’t really tell when looking at it from far away. 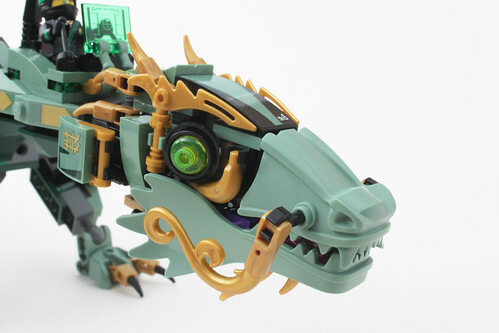 As I mentioned before, the organic look of it combined with all the sand green and pearl-gold parts is what makes this dragon stand out from other Ninjago dragons that LEGO has made. 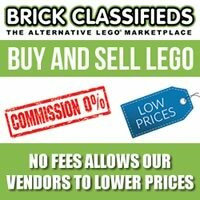 The price point is spot-on and it is worth picking up even at normal price. The four minifigures are okay but not all of them are exclusive to this set and it’s not a big deal as they aren’t the main focal point.